Don’t freak out, but the Trump campaign made a super racist television ad and successfully showed it to millions of people. Facebook just banned it, following similar bans from NBC and Fox News. (Fox News!) Election day is Tuesday. 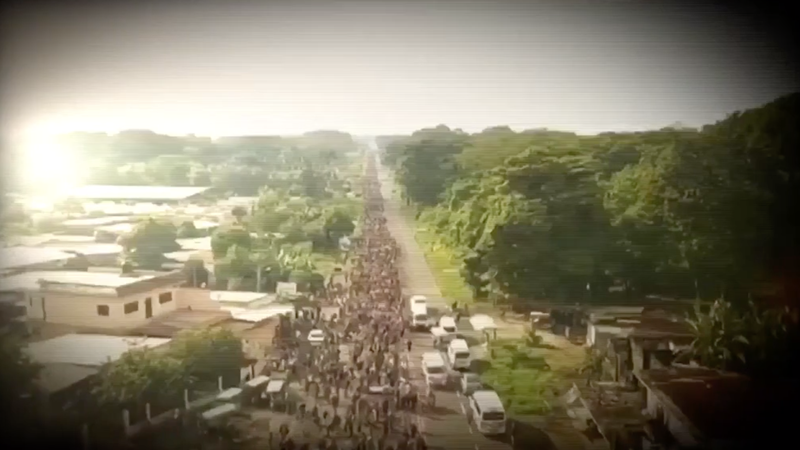 The ad in question deals with the so-called caravan of Central American refugees seeking asylum. It portrays a group of anxious mothers and children as an army of vindictive murders. It’s also a distillation of the worst parts of the Trump presidency, and the Republicans’ message that immigrants present a violent threat to national security, despite the fact that data shows immigrants commit crimes at a lower rate than native-born Americans. The 30-second primetime ad, which NBC regretfully aired during an especially frothy edition of Sunday Night football, attempts to connect Luis Bracamontes, an undocumented Mexican immigrant convicted of murdering two Sacramento sheriff’s deputies in 2014, to the caravan currently traveling north from Central America. It’s worth pointing out here that the year is 2018. Bracamontes’ crimes took places nearly half a decade ago and have no connection to the refugees currently traveling north. Nevertheless, President Trump shared a longer version of the ad on Twitter last week, and presumably spent a dreadful amount of money to air a similar message on Sunday night. Again, NBC took the money and aired the ad. Facebook did too, but now it says the ad was approved in error. Facebook, for its part, will not be promoting the ad going forward. That must feel like a little victory for those who have followed the social network’s contribution to the impending downfall of American democracy. Facebook executive Katie Harbath admitted nearly a year ago that there was “foreign interference that Facebook should have been quicker to identify to the rise of ‘fake news’ and echo chambers” in the 2016 election. Its woes didn’t end there. More recently, the company has offered a “white genocide” option for ad targeting, though some might find comfort in the fact that Facebook built a special “war room” for the midterm elections. And Facebook will not take the Trump campaign’s money to show this new, especially racist ad anymore. There aren’t any winners here. President Trump looks like a racist demagogue. NBC looks like a greedy TV network. Facebook looks like a ne’er do well of a global tech company. The Republicans, in supporting this type of messaging, look desperate. It sounds crazy, but Fox News might actually look good for turning its back on all of this. Anyways, Election Day is tomorrow. Head to the polls. Make good choices.